Spring is kind of a strange time of year to be making soup, but I know at least some of you are still experiencing freakish January-style winter blizzards. 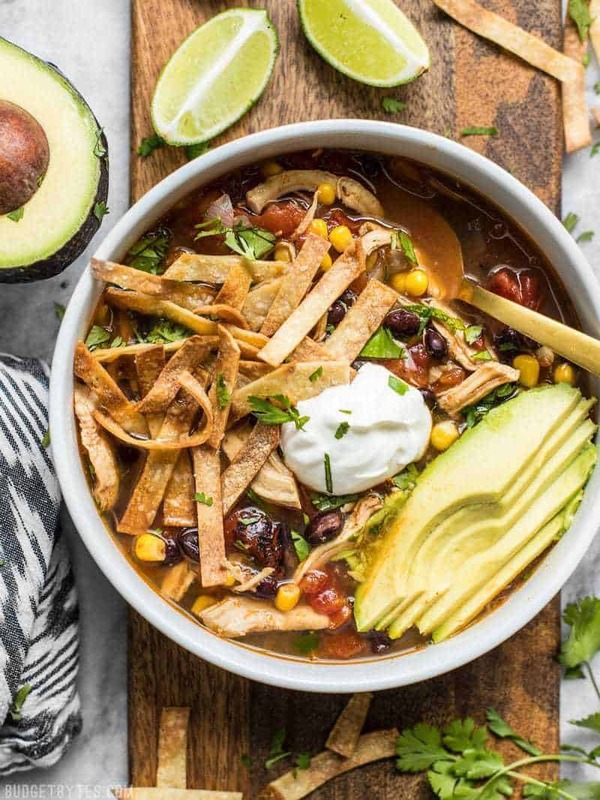 Plus, this Slow Cooker Chicken Tortilla Soup is a clear broth soup, which actually makes it light enough to enjoy in warmer weather. Squeeze some lime on top, serve it with an ice cold margarita, and you won’t care what the weather is doing. Promise. 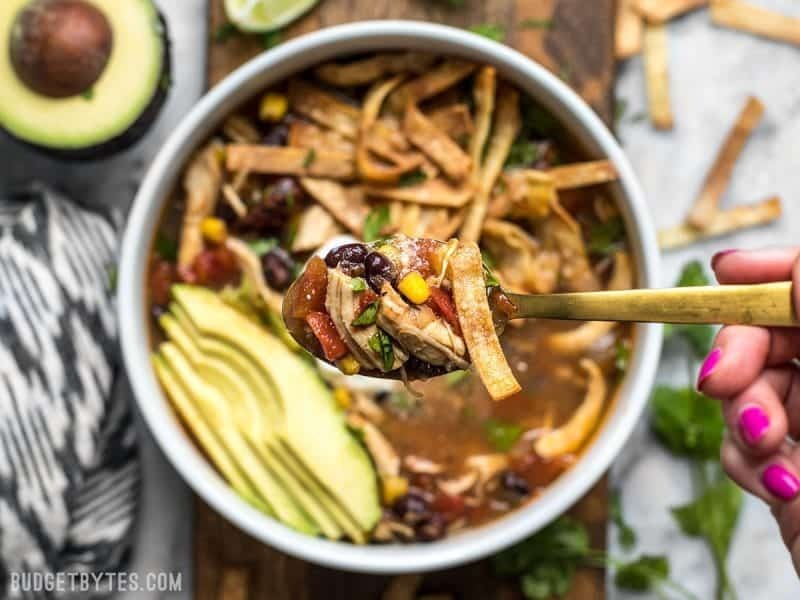 Like most slow cooker recipes, this Chicken Tortilla Soup is ridiculously easy and very forgiving, so it’s a great meal to prepare when you know you can’t give your full attention to the stove. If it goes a little longer than the prescribed cook time, it’s all good. Your meal won’t be ruined. This is a busy peoples’s soup. In true Budget Bytes style I used only ONE chicken breast for the entire batch of soup. 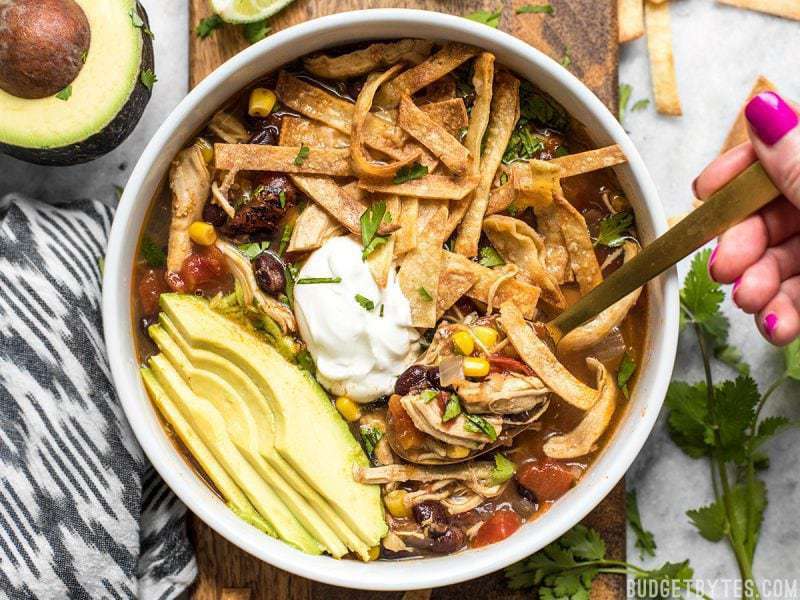 I know it sounds crazy, but I promise there is so much else going on in this soup that you won’t feel like you’re missing out. Once that chicken gets shredded and mixed back in, it looks like a lot of meat, and I promise, it’s guaranteed to be more meat per serving than any soup you’d get out of a can. But hey, if your budget affords, you can always double the meat if that’s your style (no other adjustments needed). Dice the onion and mince the garlic. 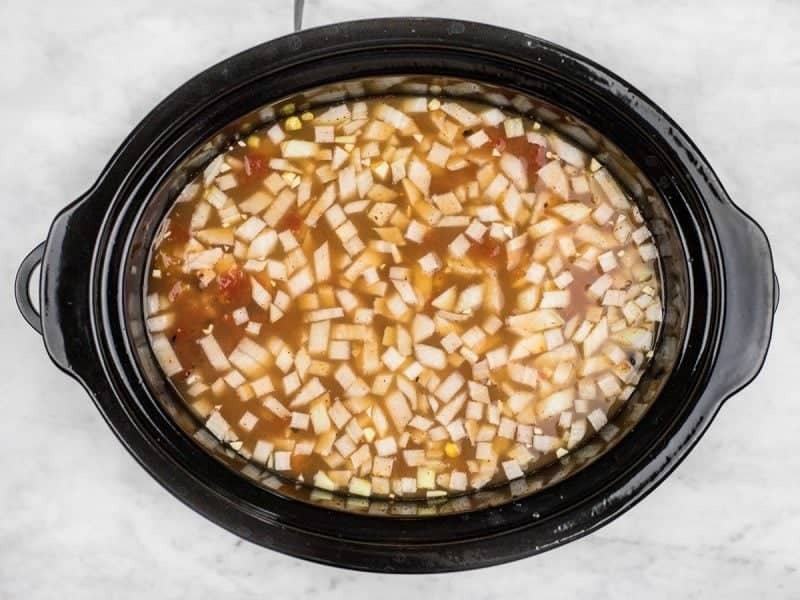 Add the onion, garlic, chicken breast, chili powder, cumin, smoked paprika, cayenne, some freshly cracked pepper (about 10 cranks of a pepper mill), the fire roasted tomatoes (with juices), diced tomatoes with chiles (with juices), black beans (drained), corn, and chicken broth to the slow cooker. 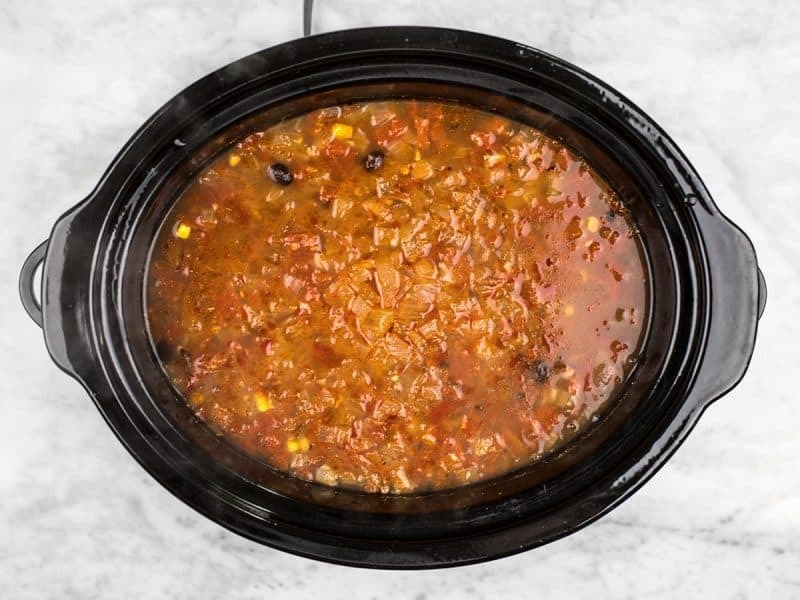 Give everything a brief stir, place the lid on the slow cooker, and cook on high for 4 hours, or low for 8 hours. 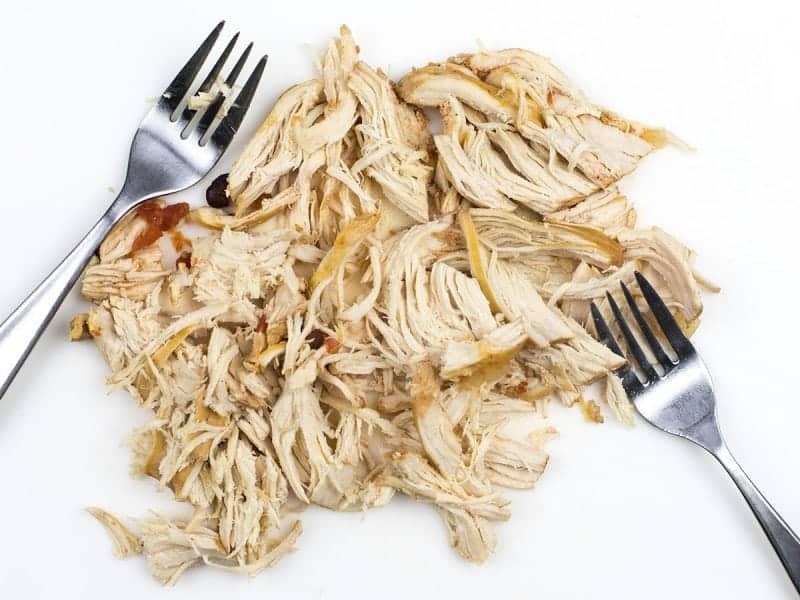 After cooking on high for 4 hours or low for 8 hours, carefully remove the chicken breast, shred it with a fork, then return it to the soup. To make the tortilla crisps, preheat the oven to 400ºF. 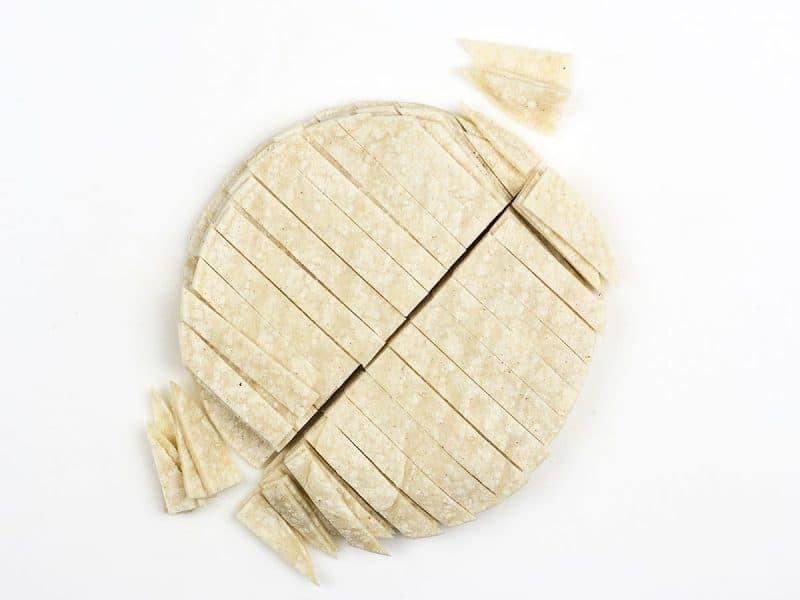 Stack the tortillas, then slice them into strips that are approximately 1/4-inch wide and 2 to 3-inches long. Place the strips in a bowl, drizzle with cooking oil, and a pinch of salt. Gently toss the strips until they’re completely coated in oil. 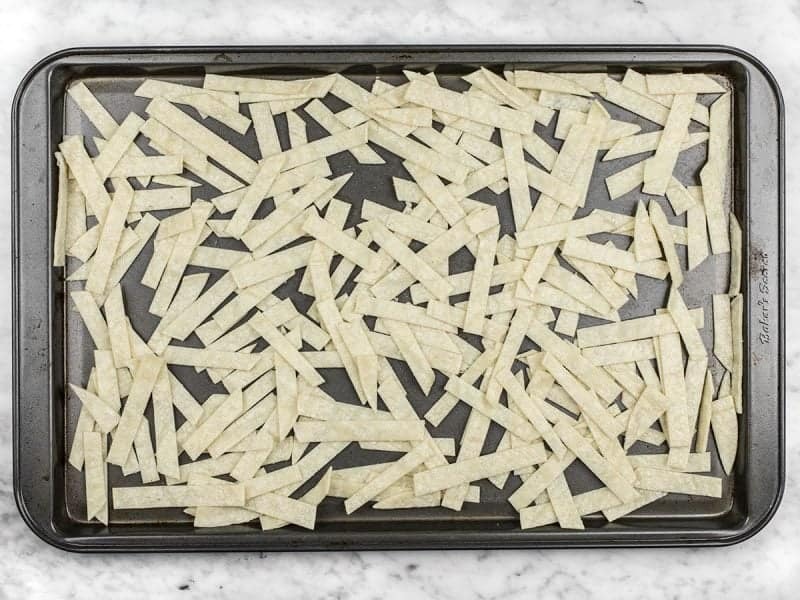 Spread the oil coated tortilla strips over a baking sheet in a single layer, overlapping as little as possible. Bake them in the preheated oven for 10-15 minutes, stirring once every five minutes, or until they are deeply golden brown and crispy. The total cook time will depend on the size of your strips and how crowded they are on the baking sheet, so watch them closely and adjust the cook time as needed. To serve, ladle the soup into bowls, top with a handful of the tortilla crisps, some chopped cilantro, a few slices of avocado, and a dollop of sour cream. Squeeze a wedge of fresh lime over top just before eating. * This chili powder is a mild blend of spices, not straight red chile powder. ** I use Better Than Bouillon to make my broth. If you’re using a low sodium chicken broth, you may want to add a small amount of salt to the soup after cooking. To begin, dice one yellow onion and mince two cloves garlic Place the diced onion, minced garlic, and one 3/4 lb. 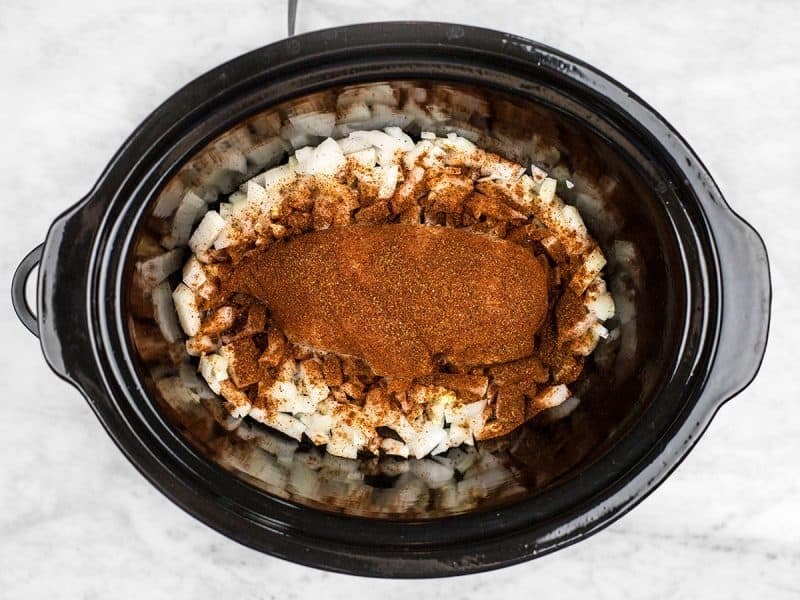 chicken breast in a slow cooker (6 qt size). You can use more or less chicken without adjusting anything else in the recipe. Sprinkle 1/2 Tbsp chili powder, 1/2 tsp cumin, 1/2 tsp smoked paprika, 1/4 tsp cayenne, and some freshly cracked pepper over top. You can leave the cayenne out if you want your soup mild, or if you’re using a spicier chili powder (every brand is a little different). Also add 1 cup frozen corn kernels (no need to thaw), one 15 oz. 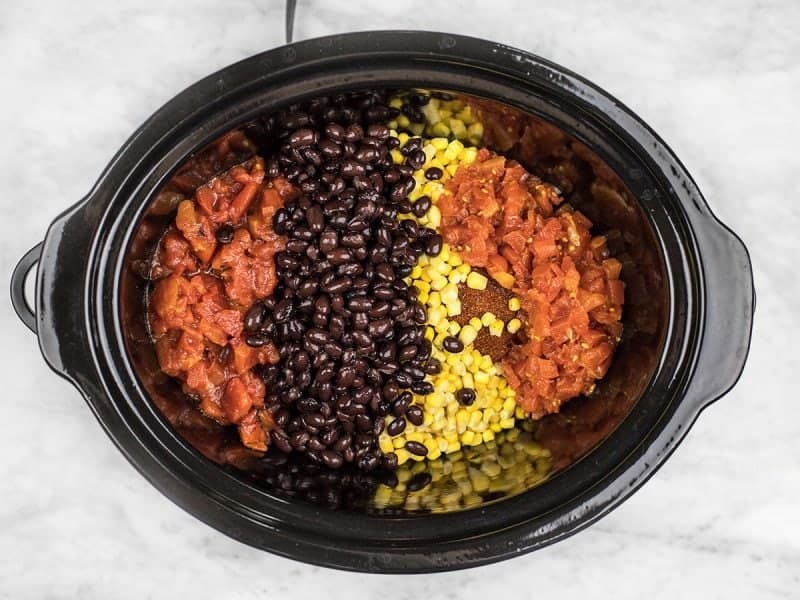 can black beans (drained), one 15 oz. can fire roasted diced tomatoes (with juices), and one 10 oz. can of diced tomatoes with green chiles (with juices). The diced tomatoes with chiles are like Rotel tomatoes, but you can often find generic store brand versions as well. If you can’t find them at all, you can use two 15 oz. cans of fire roasted diced tomatoes, plus one 4 oz. can of diced green chiles. Finally, add 6 cups chicken broth and give everything a brief stir. 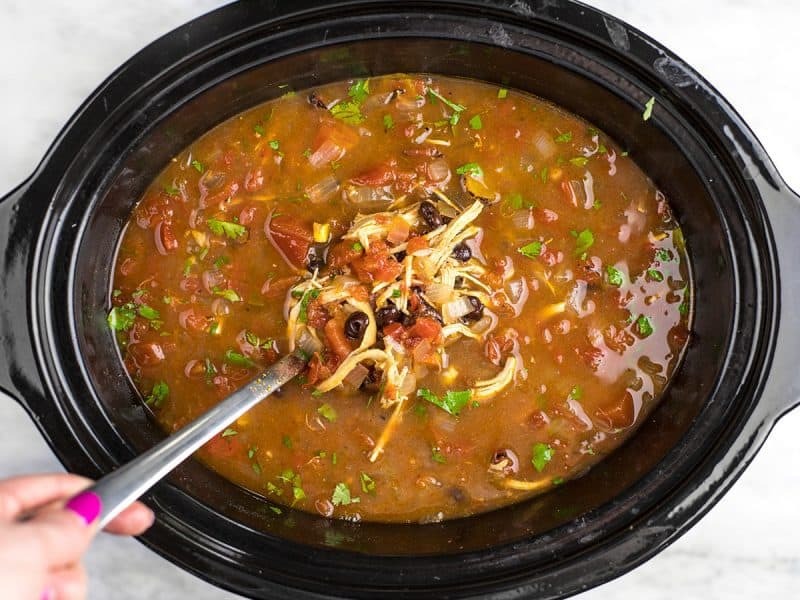 Place the lid on the slow cooker and cook on high for four hours, or low for eight hours. While the soup is cooking, make the tortilla crisps. Preheat the oven to 400ºF. Stack the tortillas and cut them into strips, about 1/4-inch wide and 2 to 3-inches long. Place the strips in a bowl, drizzle with 1 Tbsp cooking oil, and add a pinch of salt. Gently toss the tortilla strips until they’re completely coated in oil. 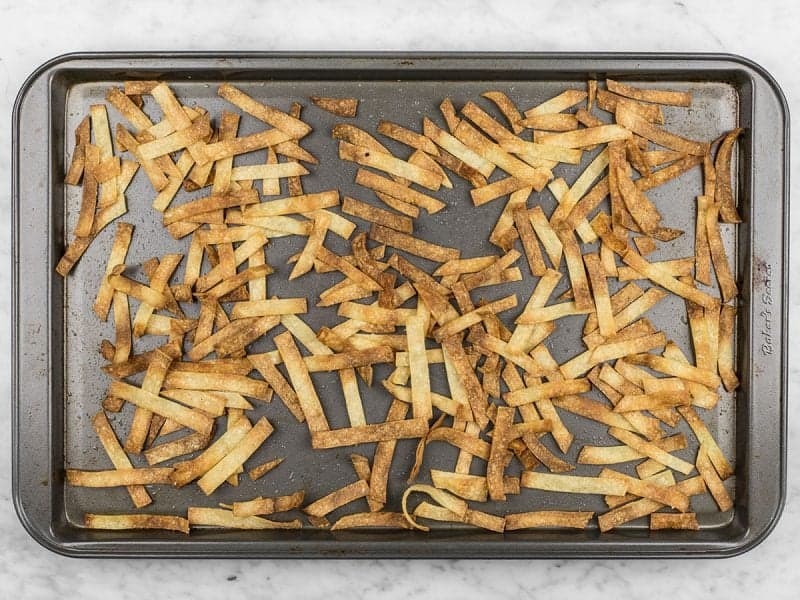 Spread the oil coated tortilla strips out over a baking sheet in a single layer. Try to make them overlap as little as possible. The more they overlap the longer they’ll take to cook. Bake the tortilla strips for 10-15 minutes, stirring every five minutes or so, or until they’re deeply golden brown and crispy. The cooking time can vary quite a bit depending on the size of the tortilla strips and how closely packed they are on the baking sheet, so watch them closely and adjust the cooking time as needed. Set the tortilla strips aside. Carefully remove the chicken breast, shred it with two forks, then stir it back into the soup. 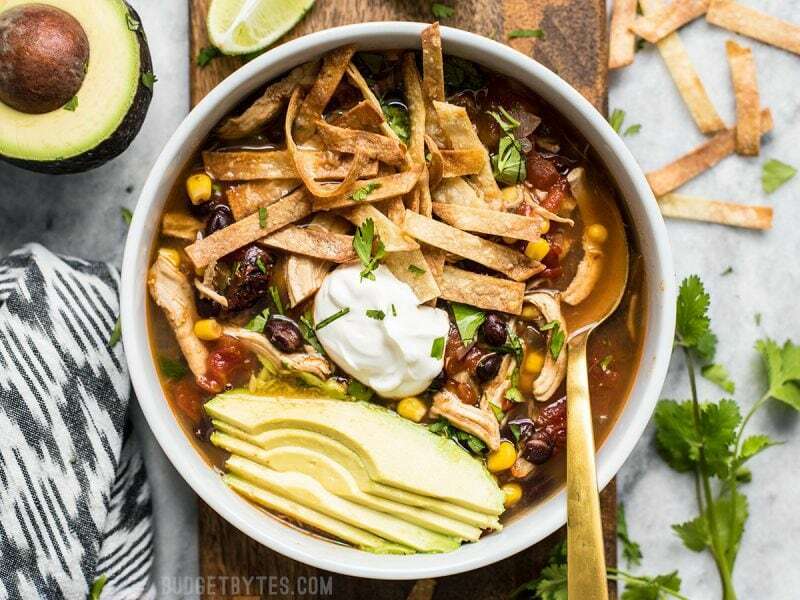 After ladling the soup into your bowls, add a handful of the toasty tortilla crisps, and optional toppings like some fresh cilantro, a few avocado slices, or a dollop of sour cream. Squeeze a wedge of fresh lime over top and enjoy! 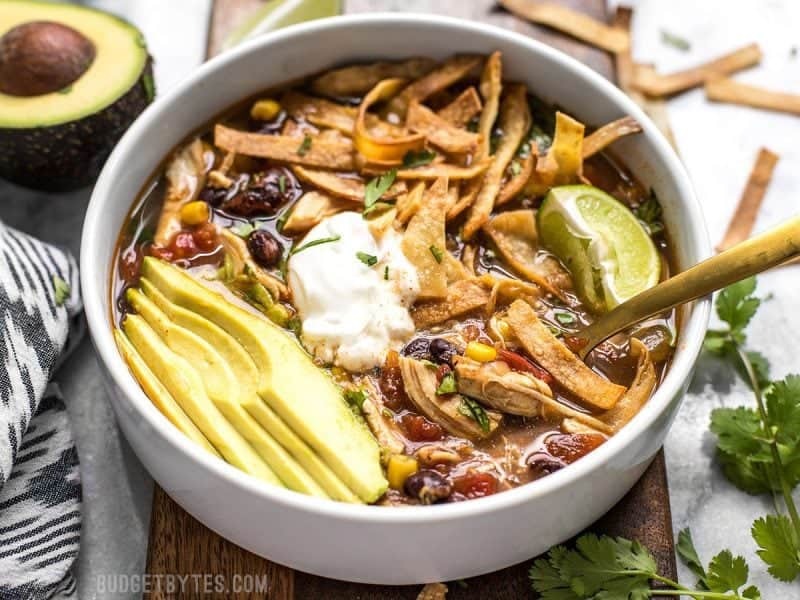 The post Slow Cooker Chicken Tortilla Soup appeared first on Budget Bytes.